Want SLR-style results and speed without all those lenses? Bridge cameras are the Rolling Stones of the photography world - sturdy warhorses that defy the whims of fashion and just keep going on and on. 'Bridge' simply means that they bridge the divide between a digital compact camera and a more sophisticated SLR device with its choice of myriad lenses. In other words, they are a compromise for people who want the power and speed of SLRs, without the faff and extra expense of interchangeable lenses. 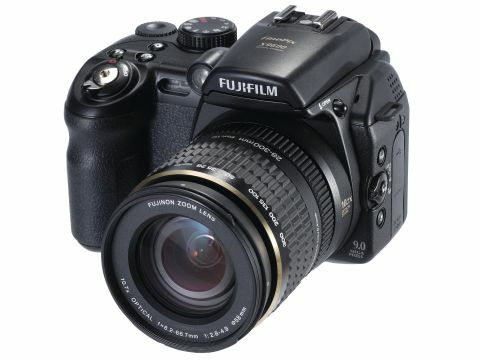 Bridge cameras have always sold themselves on their integrated power zoom lenses, and the Fujfilm S9600 is no exception. It sports a whopping 10x optical zoom lens (28-300mm equivalent) which works as well for wide angle work as it does for telephoto. While this means the camera is as big and heavy as a typical consumer SLR, it also means you don't have to lug extra lenses around. Furthermore, the S9600 is significantly cheaper than an entry level SLR with a couple of kit lenses - you can bag it for under £300, which is extremely good value. So for most readers, the big buying decision will be made before you even consider the S9600. It'll boil down to whether you want a proper SLR or all-in-one bridge camera. If you do decide to go for a bridge, the S9600 is one of the best examples on the market. We're talking a high resolution, nine megapixel sensor that will be more than enough unless you want to print photos at billboard size, along with that powerful and flexible 10x zoom lens. The ISO (light sensitivity) can also be boosted right up to 1600 without miring the images in noise. As with Fujifilm's cheaper compacts, this is a great camera for circumstances where you can't (or don't want to) use flash. Owners of the older S9500 will be hard pressed to spot the changes to the new model, as it's housed in the same bullet-proof black chassis that will cause casual observers to mistake it for an SLR. Despite its bulk, the S9600 feels great in the hand, and as mentioned, you're making a significant weight saving by not having to carry around extra lenses. One of the biggest advantages that bridge cameras have over comparably priced SLRs is their live image preview, and the new, high resolution LCD on the S9600 makes this advantage count. With 235,000 pixels on offer, the LCD is bright and clear in the most dazzling sunshine, and a real aid to good composition. Auto-focusing is right on the money, though the noisy mechanism is a disappointing throwback to the bad old days. That said, cheaper SLR such as the Sony Alpha or Canon EOS350D are hardly silent all the time, either. As mentioned, a big selling point of this camera is its powerful integrated lens. As with its predecessor, the S9600 is an impressive performer. A maximum aperture of f/2.8 comes in very handy, and creative effects, such as throwing the background out of focus while keeping the foreground sharp, can be achieved in seconds. As mentioned earlier, noise is impressively controlled throughout the ISO range. The 1/1.6-inch sensor is smaller than you'll find on SLRs, but does a great job - and the slightly bigger sensors you get on similarly priced SLRs don't completely eradicate noise either. Fujfilm's image processing technology produces smooth, vibrant images, which manage to be arresting without being lurid or oversaturated. So, in all, we're very happy. The S9500 was a great bridge camera and this upgrade inherits all its virtues, while incorporating some new virtues of its own. For £300 we would seriously consider this over an entry level SLR; while you won't have the cachet of SLR ownership, your everyday shots will be just as good, if not better. And isn't that the most important consideration? While we like this camera a lot, it's not the best when it comes to working with photos saved in the RAW format. As most readers will know, RAW refers to unprocessed, uncompressed digital photographs that you can fine-tune for maximum impact, and the S9600's RAW files tend to be rather unwieldy. Another problem is the supplied HyperUtility 2 software for RAW to JPEG conversion. While it works fine, it can be infuriatingly slow, so this is probably not the package for semipros in a hurry to get shots to clients. A Camera RAW plug-in is available for Photoshop, but the results are worse than using the Fujiflm software. While we wouldn't consider the rather clunky RAW processing a deal breaker, you certainly need to consider this niggle when making a buying decision - it's one thing we would like Fujifilm to improve.